Optional URL pointing to an online mapping service that shows the location. Describes the project's address, and geo location (lat / long / elevation). Note that if there are more than one street address, the model forces these to be separate Sites/Projects. If a Building on the project site has more than one street address, only one is required to identify the location. Also known as "AHJ." This is the city, county, or other authority with jurisdiction over building permits and inspections. Is the project buyer the owner of the site? If the project customer is not the owner of the site property, what is the relationship to the owner? This is required for CSI incentive application. Does the site have, or can get broadband internet? Dial-up only probably won't work. Describes the set of weather stations, or geographic cells used to specify the site's weather. Examples include: WBAN, WMO, NREL 40km Monthly Grid Cell, etc. The ID number used within the associated Station Category system. If the Station Category is "WBAN," then this element would contain the WBAN number for the desired station. For example, San Francisco, CA is WBAN "23234." And Cairo, Egypt is WMO "623660." 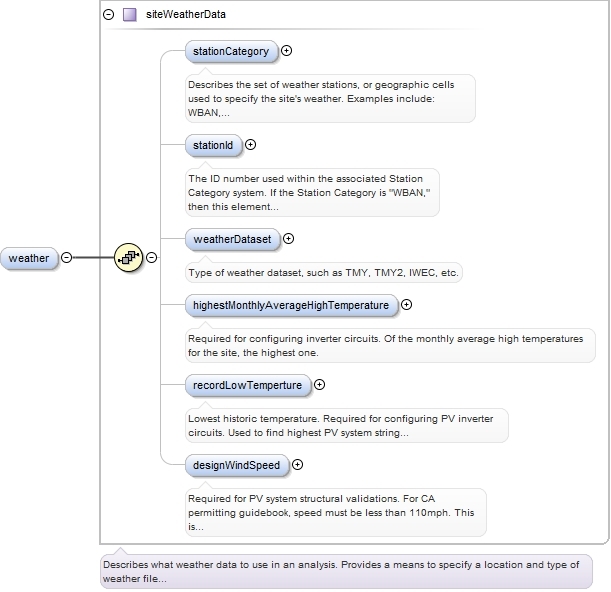 Type of weather dataset, such as TMY, TMY2, IWEC, etc. Required for configuring inverter circuits. Of the monthly average high temperatures for the site, the highest one. Lowest historic temperature. Required for configuring PV inverter circuits. Used to find highest PV system string voltage when cold and sunny, and therefore longest possible string. Required for PV system structural validations. For CA permitting guidebook, speed must be less than 110mph. This is based from ASCE 7-10, risk category II for CA. Site has existing generation capability, including non-functioning &/or emergency back-up? Required for CSI Rebate Reservation. If site has existing generation, describe the technology. Required for CSI Rebate Reservation. This is simply a descriptive name, typically a common name used for the system. Place for user to include additional notes/description. This defines the classification type of the building in terms of residential or non-residential / commercial and further details where relevant. Fraction of GrossFloorArea that is heated. Fraction of GrossFloorArea that is cooled. This is the typical maximum occupancy for the building and does not relate to fire codes. This is not currently validated against the NumberAdults, NumberInfants and NumberTeenagers. This is the typical number of adults occupying the building during normal occupation hours. This is the typical number of teenagers occupying the building during normal occupation hours. This is the typical number of infants occupying the building during normal occupation hours. This defines the number of bathrooms where a whole bathroom includes toilet and shower, half baths only include toilets. Number of kitchens or cooking environments. 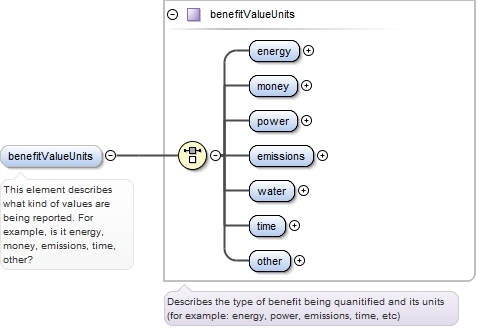 This is an input for certain space types in Energy Star Portfolio Manager. Describes the source of the provided solar access percentages, for example: "user estimate", "Solmetric skyline", etc. Use to describe the measurement. May be the name of a Solmetric Skyline, for example. 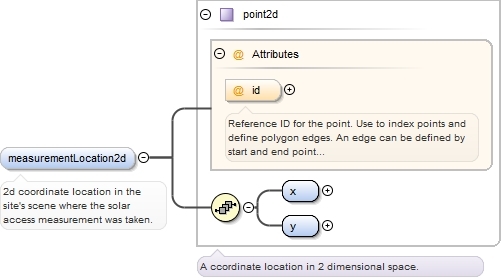 2d coordinate location in the site's scene where the solar access measurement was taken. Reference ID for the point. 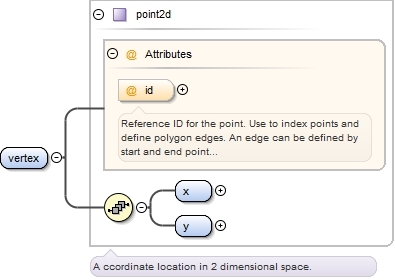 Use to index points and define polygon edges. 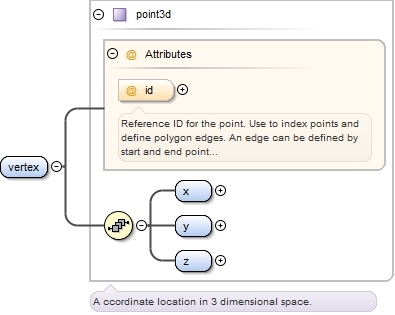 An edge can be defined by start and end point indices. 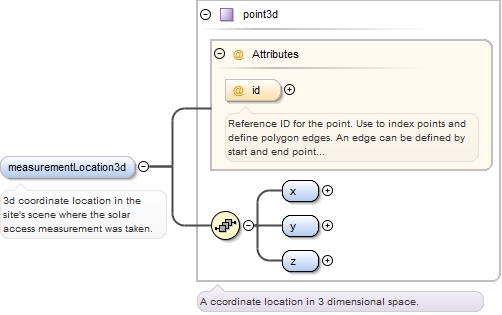 3d coordinate location in the site's scene where the solar access measurement was taken. Names the specific benefit (or cost). If Benefit is an incentive, this should be the Name of the incentive program. Optional description. For example, many incentive programs break their pools of money into discrete steps where the payment rates vary (for example, "Residential Step 8"). This element describes what kind of values are being reported. For example, is it energy, money, emissions, time, other? 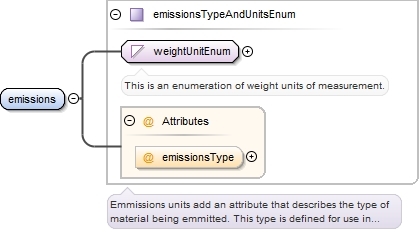 Fuel type specified as an enum. The "rating" or list of conditions at which the power was tested. Describes a Benefit (or cost) amount. When used for an incentive, this amount is a single incentive payment (assumed to be USD). Typical for capacity or investment based incentives in solar, as well as single year tax credits. Use the Name attribute to capture optional name for the payment. For example, if the incentive extends over several years, a year number can be assigned to the amount (for example, "Year 1"). An optional name for classifying the value. For example, energy bills frequently break the consumption down by time of use period. This category can be used to classify that time of use period. This is the calendar date associated with the value. 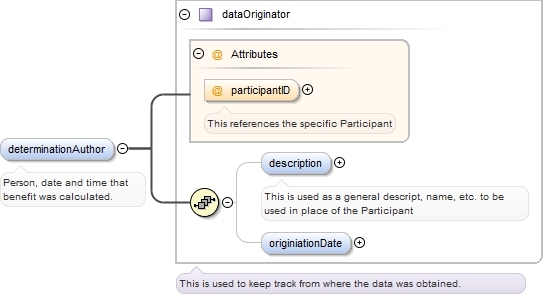 Typically used when DataValueType is used for site audit datalogging. When data value is associated with a duration of time, this number describes its length. 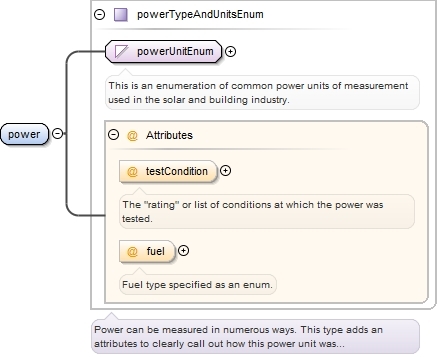 Note that Units must be described in an associated TimeUnit attribute within the element where this DataValue resides. Useful when defining energy billing periods that do not correspond to calendar months. Use this attribute to capture the number of days in the billing period. 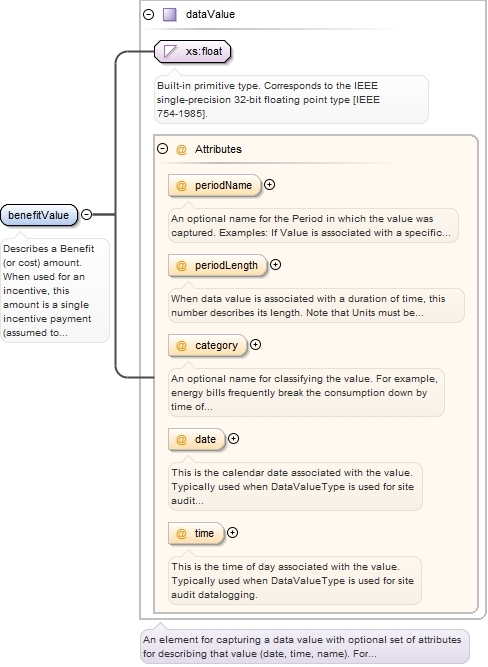 An optional name for the Period in which the value was captured. Examples:  If Value is associated with a specific calendar month, then this attribute might be the month's name. If the value is an annual value, then the attribute might be "Annually"
This is the time of day associated with the value. 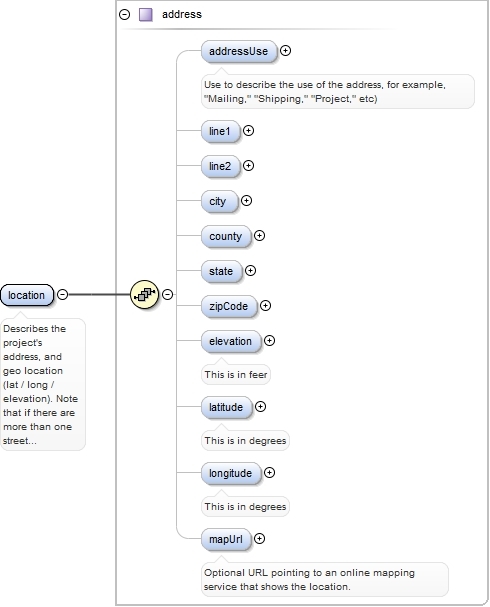 Typically used when DataValueType is used for site audit datalogging. Tool used to calculate the benefit. Person, date and time that benefit was calculated. This is the year in which this event occurs relative to implementation. This is the time frame in months of the periodicity of the event. This is the frequency of the recurring event. This represents the description of the cost, i.e. maintenance costs, purchase costs, salvage costs, etc. Name of the entity who manufactures the equipment. Manufacturer's unique identifier for this model of equipment. A general name for a group of product models. Typically each member of the family differs in size or capacity in some way. Detailed description of the product. Describes how the equipment/box is installed (or designed to be installed). This is important for determining components required for interfacing with it. Suggested values include: Wall Mount, Wall Mount-Surface, Wall Mount-Flush, Pad Mount. Dimension assumed to be meters. The long dimension of the equipment's primary envelope (for example, the height of a wall mounted inverter, or the long edge of a PV Module frame). Dimension assumed to be meters. The width dimension of the equipment's primary envelope (for example, the width of a wall mounted inverter, or the short edge of a PV Module frame). Dimension assumed to be meters. The dimension of the equipment's primary envelope perpendicular to the side of its primary interface (for example the thickness of a PV module's frame, or the thickness of a wall mounted inverter from the wall to the front of the inverter.) Note: PV Module thickness with J-box would be given as part of PvModuleDefintion. Weight of equipment in kilograms (kg). The material making up the enclosure, such as steel, stainless steel, fiberglass, PVC, etc. Equipment enclosures typically have a NEMA rating that describes its protection from weather/elements. Description of Manufacturer's warranty on the equipment. Does the equipment have an EnergyStar rating? In which country was the equipment manufactured? Important to know for some incentive programs, as there may be a requirement for rebates to only be paid on domestically manufactured equipment. A user provided name for convenience. For example, an electrical panel might be the "Main service entry panel", or the "AC combiner panel." A pvModule name might be to identify a specific string or AC branch circuit, for example, "S1-M1" or simply "1" of the total number of modules in the string - typically named in a series.